Kafka & Cube Whale are about to ship to various collectors around the world! Some of you have missed the pre-order slots but we spoke to Sank and he would like you all to know a handful of reserved stock will be made available. 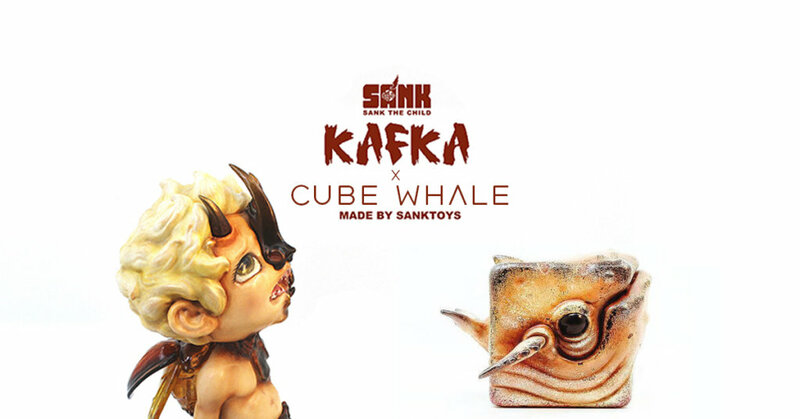 Its been a long time coming and Sank would like to reintroduce his Kafka based on an anti-bullying campaign and the Cube Whale” series in an art collectable. When I was a child, I read the writer Kafka’s “The Metamorphosis”. The Protagonist in the novel, Gregory, turned into a big beetle for no reason. At that time, although I did not really understand the meaning of the work, I am deeply impressed by the transformation from a man to a beetle. Until high school class, when teacher system introduced this work, she mentioned a concept called “alienation.” Gregory’s humanity was distorted and he could not feel the existence of himself. He did not get rid of the irresistible alienation before he died. This “alienation” power is still ubiquitous in today’s so-called civilized world. In March 2015, the incident that Chinese students’bullied their Chinese classmate in USA was shocked. The victim was abused for 5 hours. The absence of supervision in USA, the bully Ba Ling completed the “alienation” and became violent. On the other side, the shadow of bullying for the bullied, like the alienated seeds buried in the heart, accompanied by life. After this incident, I began to consciously pay attention to campus bullying. After reading many reports and documentaries, I found the complexity and seriousness of this problem. Americans are generally aware of this problem, but it is only the last 20 years. In the history of the United States, what really changed the view of campus bullying among the people was a tragedy that many people might have heard of – the Columbine campus incident in Colorado in 1999. On April 20, 1999, high school students Eric Harris and Dylan Klebold rushed into Columbine High School with guns and explosives. They shot and killed 12 students and a teacher, wounded more than 20 people, and finally committed suicide. Subsequent investigations show that the bullying phenomenon in Columbine High School is very common, and the two murderers are long-term victims of bullying! More importantly, this is not an accident. Americans are beginning to realize the seriousness of the problem. From 1999, the first state in Georgia passed the anti-bullying law. By 2006, 16 states passed the anti-bullying law. In 2012, the number rose to 49. By April 2016, after the anti-bullying law was passed in Montana, all states in the United States passed the anti-bullying law. In contrast, China’s campus bullying has long been ignored, even if it is reported. In any case, bullying is an old problem. The bullying incident is still endless. It will not change because of some simple rules, but it depends on the efforts of the whole society. I like to use children in my work. It may be that the child has some possibility of being unfixed. The beetle boy Kafka in this work is in the process of “alienation”, and the lonely eyes are helpless. In China, how many children who have been plagued by bullying for a long time can only choose to silently endure? I hope that this work will attract people’s attention to this phenomenon. Missed out on Kafka & Cube Whale? Email Sank at [email protected] be quick as only a handful have been reserved.